Still, the faster tempos on El Camino are something of a concern for Carney, who knows they’ll be even harder to play in concert. 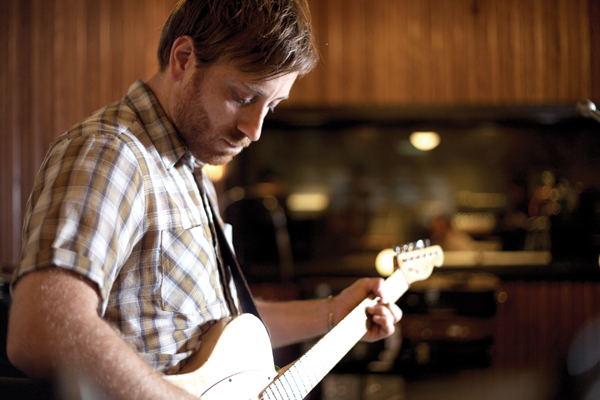 Live, The Black Keys usually tend to speed up their songs. Maybe that’s why El Camino, with its 16th note drum patterns and breakneck power chords, still sounds like something you’d hear at a Black Keys show, even if several of the songs stretch the band’s boundaries. “Gold On The Ceiling” ropes in some thick gospel harmonies from a trio of “local girls” who sang alongside Auerbach in the studio. “Stop Stop” mixes retro R&B and Brill Building pop with skuzzy classic rock, pitting a dirty slide guitar against handclaps, glockenspiel and falsetto vocals. “Money Maker” features a distorted talkbox solo (“They’ve sort of become a joke, but they’re amazing,” Auerbach enthuses), and the opening track, “Lonely Boy,” suggests what might’ve happened if Led Zeppelin had looked to Motown instead of Mordor for inspiration. Carney is a big Zephead, the kind who demonstrates the power of his new living room speakers by playing “Whole Lotta Love” at high volume. He’s careful not to list them as an influence – Auerbach, whose taste for blues music tends to run closer to the early stuff, doesn’t listen to much Zeppelin – but there’s an unmistakable whiff of “Stairway To Heaven” to “Little Black Submarines,” an epic acoustic ballad that goes electric during the final two minutes. Not entirely unlike the demo that kicked things off … although the studio was much nicer this time around. For the first time since early 2010, The Black Keys are finally enjoying a bit of a break. The album is done. The tour hasn’t started. It’s been ten years (“ten years ago this week,” Carney reiterates) since the day Auerbach showed up at Carney’s Akron apartment, hoping to record a demo. After a year of milestones – their first gold-selling record, their first chart-topping single, their first (three) Grammy Awards – the guys are celebrating this anniversary with their feet up. At the same time, they’ve kept themselves busy. Carney, still new to Nashville, has been exploring the city, installing a backyard deck (“It basically functions as a giant drum for Charlotte,” he says, referencing the thud that erupts every time his dog drops her bone) and indulging his Twitter habit. Recent tweets include “I usually do it all for the gnocchi,” “I wonder what Murphy Brown smells like,” and “If I’m such a narcissist why am I so awesome?” He also produced the sophomore album by Tennis, a lo-fi pop band signed to The Black Keys’ former label, Fat Possum. Fans have started asking questions about Blakroc 2, the supposed sequel to the band’s collaborative album with hip-hop artists. A trailer for the record even leaked onto the Internet several months ago. Auerbach says it’s all a misunderstanding, explaining that the “trailer” is just an unauthorized clip of studio footage from the first Blakroc album.